This is for all the Coaches who I know! This entry was posted in General on April 3, 2018 by Tony Husted. How I lost 72 Pounds! 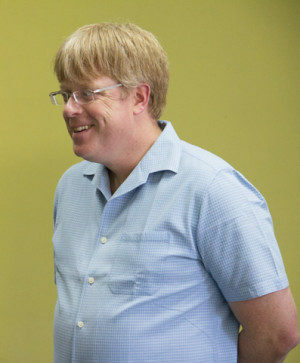 Over the last few years I my weight has been up and down. My all time max was a whopping 254. 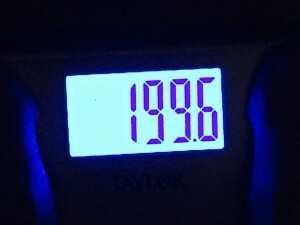 My weight bounced up and down several times including drops to the low 190’s and a few trips back up into the high 220’s. Then in June of 2015 I ran across Bulletproof Coffee and the Bulletproof Diet. Around 2 weeks ago I was down to 183 pounds on the scale. 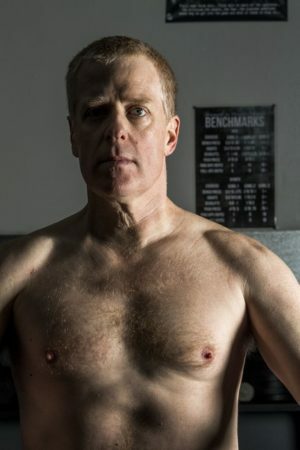 I have also gotten several DEXA scans along the way to track how my actual Fat and Lean Muscle I was losing and gaining depending on whether I was lifting weights and eating to build muscle, or if I was cutting. In short, the BP Diet (which I like to think of as am Eating Habit, not an actual diet) is a High Fat (Must be high quality), Medium Protein, Low Carbohydrate diet. The premise is quite simple: The entire Low Fat food craze which has been at the center of even the USDA Food Guidelines for the last 30 years was based on bad science! The human body is bi-fuel, it can either burn Carbs/Sugar or it can burn Fat. Most Americans eat so many carbs that their body is Carb adapted. This means very simply that you eat carbs, your blood sugar goes up, blood sugar crashed, the body fears a famine and goes into cravings. When consuming a high fat diet, blood sugar remains constant and the body is “tricked” into thinking it is a feast time, and the body sees no need to store fat. Counterintuitive I know! Check the science though! For me this was more than just about losing weight. I had struggled for most of my life with ADD and was even diagnosed and medicated as an adult for it. The downside was that the medication had horrible side effects, and really very little upside. I wanted to sharpen my mind, be more productive, increase my athletic ability, build muscle, and lose weight. I make my living as a Life Coach, and training others to be Life Coaches, and this also drives me. How can I stand in front of a room full of people and tell them that they can achieve what they want, and the sky is the limit and at the same time not have it in my own life. It felt like an integrity issue. If I am to inspire people, it can’t be just words, it needs to be fully reflected in my own life. Beyond the “diet”, most people want to know how I did it. The short answer, I made my goal Inevitable! I set up the entire goal to be an integral part of my life, with support, accountability, short term action plans, long term milestones, focused on learning new skills, made different choices, I lived up to my commitments, focused on living this way through experiencing my personal values, included 100’s of people hoping that they would get inspired with me, all with the end goal of becoming more of the person I was created to be, and to fulfill the Vision for my life! The single biggest reason I made it, is simple: my wife! Vanessa has always been my biggest supporter and when I began this journey she was all for it. She has been there through the ups, middles, and deep lows. When I wanted to throw in the towel, she was there and just kept loving me. Without her, this would not have been possible. She has always supported me pursuing my dreams! Another big contributor who deserves serious praise is Ian Padron. 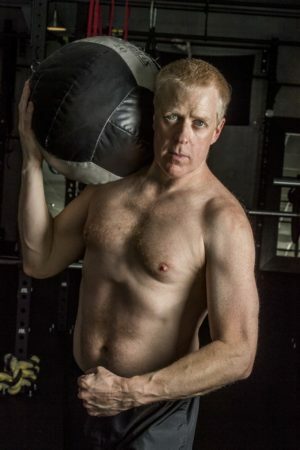 He is my Personal Trainer, and one of the most knowledgeable people I know when it comes to Health, Nutrition, and Fitness. He also can throw down some of the hardest workouts I have ever experienced, while at the same time keeping the technical side present. I learned more from him about weight lifting in the first 8 weeks I worked with him, that I had in the 20 years prior. I can highly recommend him to help you with your fitness goals! Check him out at Padron Performance. Dave Asprey and the Bulletproof Diet were a BIG part of my success. 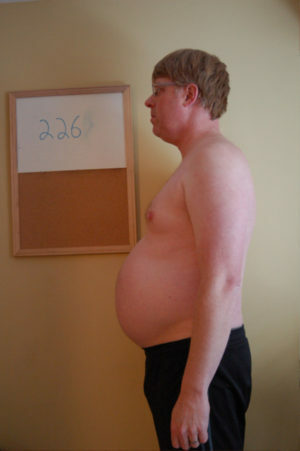 I had pretty decent success with the “4 Hour Body”, a diet from Tim Ferriss. 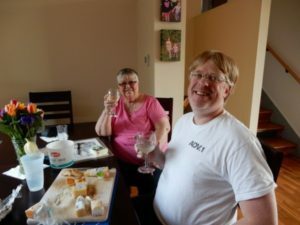 Over the long run it was a wonderful way of eating, but the cheat days threw me off quite often, and eating so many beans (beans are the main source of carbohydrates) gave me some gastric distress. When I first ran across Bulletproof Coffee, it seemed to be a very off thing, butter and MCT oil in coffee! The big thing that surprised me was the fact that the Bulletproof Diet was a high fat diet. That was until I read about the bad science that created the Low Fat, No Fat, Fats makes your Fat Fad. In short, Fat doesn’t make you fat, Sugar does. You need high quality fats to be healthy. When I started the Bulletproof diet I was fairly optimistic, but since I had run into problems with all the other diets I had tried over the years I was a little hesitant, but I jumped in and went for it! I read the book, I watched all the Youtube Videos, I listened to a ton of past Bulletproof Podcasts all with the intent of gleaning as much information as I could. I bought some of the products and tried the supplements. As my knowledge grew I was able to trouble shoot my problem areas. When I couldn’t I sought information from those with expertise. Overall my routine is fairly straightforward, I drink Bulletproof Coffee and take my supplements in the morning, I eat a high fat, high protein, low to no carb lunch, and for dinner I eat high protein, high fat, and a small amount of carbs. The carbs I do eat are of the Bulletproof variety and are ones that affect blood sugar very little. Check the Bulletproof.com website for all the detailed information. First off I want to thank everyone was part of the journey. So many of my students, clients, colleagues, and friends who supported me in so many ways! Thank you for being a part of this! 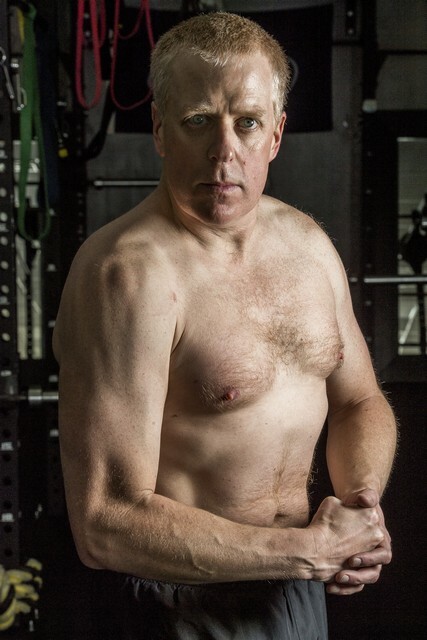 Thank you to Nick Williams who’s own fitness journey provided initial momentum and the photoshoot idea. 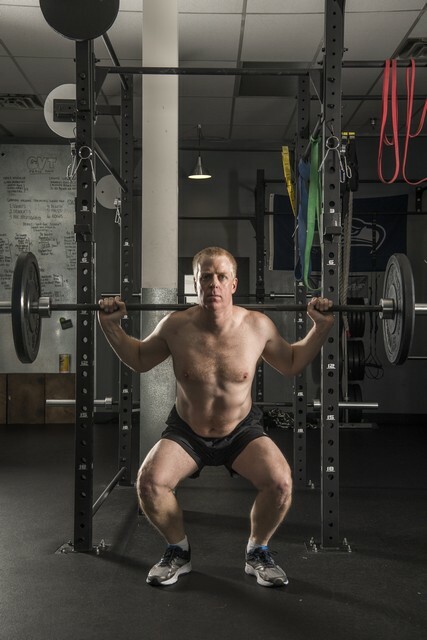 Thank you to Jessica Renon, owner of Fitness 2.0 in Shoreline for having and amazing facility to train at, and for the opportunity to shoot the photos! The photos were taken by Jason Tang, Atomic 80 Photography! This entry was posted in General on February 27, 2017 by Tony Husted. 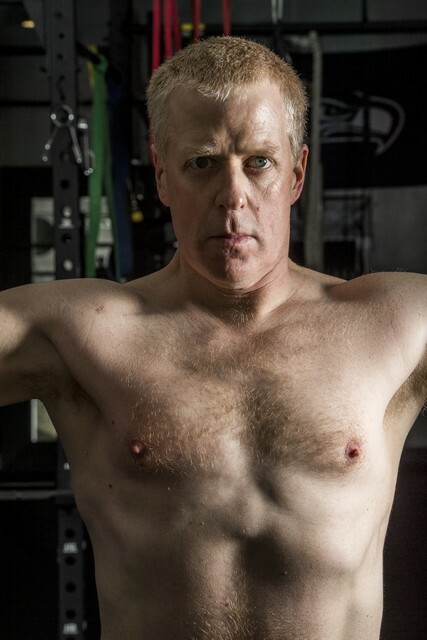 Getting very excited about reaching my personal fitness and health goal later this month. It got me thinking about how I set myself up for Inevitable Success! This entry was posted in General on February 7, 2017 by Tony Husted. 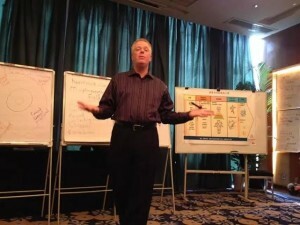 Just completed 8 amazing days of delivering Coach Training here in Guangzhou, China. 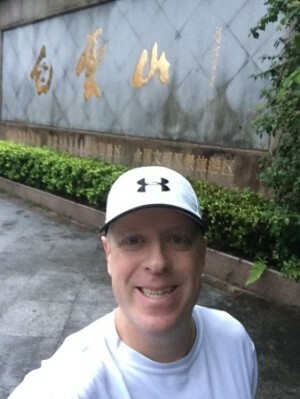 5 days ago on my day off 2 students and my interpreter took me to Baiyun Mountain in the center of Guangzhou. It was amazing. We went pretty slowly up the mountain, 1253 foot in elevation, as one of my companions isn’t used to such activities. I decided I was going to use my day off today to conquer the mountain by running up it! It is 3 miles from the base to Moxing Summit. When I went up 5 days ago we took the stairs which are steeper, but shorter. I decided to run up the road which is longer, but less steep, with the intent to run the whole way. I got a good start, but the 74 degree temperature with 86% humidity hit me pretty hard. About a half mile into the run I saw a man running down and it was obvious that he was a serious runner, he was flying down. We waved and I keep on going up. Around 5 minutes later, he caught me, nodded his head and kept running past me, then out of nowhere, he slowed down and started to run with me. It became very clear that he spoke no English, and my Chinese is limited to about 20 words, none having to do with running. He silently and with hand gestures encouraged me. He would indicate with his hand when we were just about to a flatter section and he would pick up the pace the smallest amount. Then when we would hit the flatter section he would back off and let me catch my breath. I have no idea if I would have been able to make it without him, I had several moments where I desperately wanted to walk for a second, but he was willing me on. 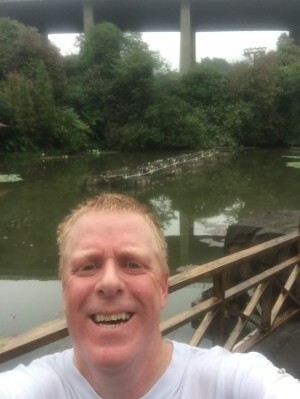 On one of the flatter portions of the road near the top he was wringing the sweat out of his shirt and I saw the English words: Guangzhou Running Club, so as I suspected he was a serious runner. Near the top, there is a split, one way is down the opposite side of the mountain and the other goes up to Moxing Peak, which is up a bunch of steep steps. Before we got to the split, he made several hand gestures indicating he was going down the other side, he waved, and he left me in the dust. I spoke 3 of the Chinese words I know, “Ai Xiexie” (Love, Thank you) and he was gone. I suddenly had the realization that he had run up one side of the mountain, down the other, then back up! The distance he ran had to have been at least 12 miles! My Fitness App on my iPhone registered 80 Flights of stairs climbed even though I didn’t take the stair short cuts! Feeling so very blessed to have opportunities like this to meet amazing people from around the world. Spontaneous moments when I step back afterwards and am moved to tears. Here I am halfway around the world in a city of 8 million people and I found someone who saw me and wanted to share in the moment. This entry was posted in Athletics, General on November 21, 2016 by Tony Husted. For the last 5 years I have been on a serious journey to become healthier, happier, and more productive. I have tried several diets and have experienced some real successes, some backsliding, and some side effects. A couple months ago after no longer being able to lose the weight I wanted to using the diet I had been using for almost 5 years, I was introduced to and switched to the Bulletproof Diet (BPD). One of the key components is Bulletproof Coffee (BPC). I felt very different in several areas of my life since switching, including my weight, energy, focus, emotional stability, and my relationship with coffee. The work trip I just completed to China is a perfect example. I took all my supplies to be Bulletproof in China including my ground coffee beans, Aero Press, one and a half pounds of Kerrygold unsalted butter, MCT oil, and my hand held Cuisinart. Before I go into details about my experience being Bulletproof in China, let me tell you about my traveling over the last 8 years training Professional Life and Business Coaching skills in 11 countries including Brazil, Singapore, Kazakhstan, the Czech Republic, the Slovak Republic, France, and Estonia most recently. For the last 5 years I followed Tim Ferris’s 4 Hour Body (4HB) and had good results with my weight, but over time I couldn’t maintain it, and always slipped back into bad habits. I really appreciate everything I learned and the results I got from 4HB, but after 4.5 years I could no longer get my weight down even when I was home and strict with myself, let alone when I traveled. The importance of this comparison is that this is how I earn my living, and my ability to do a good job related to how much work I get in the future. I usually travel internationally for 9 to 18 days once a quarter. The health pattern has almost always been the same. I arrive in country and it takes several days to get over the jet lag. I have tried quite a few methods and usually could do pretty good, but I could feel the effects for 4 to 5 days. Not a good way to start. A normal training day went like this. Wake up tired, blow off exercising because I was too tired, and eat breakfast at the hotel doing my best to avoid wheat. Most places I went beans weren’t an option and they are integral to 4HB as they replace carbohydrates which are used for energy. I typically would end up eating some bread simply because no matter how many eggs I ate, I was still hungry. Breakfast also would usually consist of at least 2 cups of coffee. I would head out to the training location, and upon arrival I would have another cup of coffee as I was feeling a little stressed. Some of the locations had wonderful croissants, donuts, or local versions of sweet treats. I couldn’t resist. I felt like I needed it. Then I would teach till the morning coffee break, at which time I would rush to get to the coffee machine, and of course, by this time I was craving carbs, so more sugar was often the solution. Lunch was typically a struggle, but most of the time I would do a salad or some selection that wasn’t pasta, sandwich, etc. Meat and veggies were often the best I could do followed by another cup of coffee before teaching again. The afternoon break would usually consist of another coffee, and more sweets because by this time I was running low on energy. By the end of the day when I got back to the hotel I was running on empty. As a trainer I always felt like I needed to bring a very positive, and high energy presentation and be an example of what I was teaching. I am realizing as I write this, that I was sometimes drinking 10 cups of coffee during a training day, and I can only imagine what that did to my adrenal gland. Now my latest experience, my Bulletproof experience. 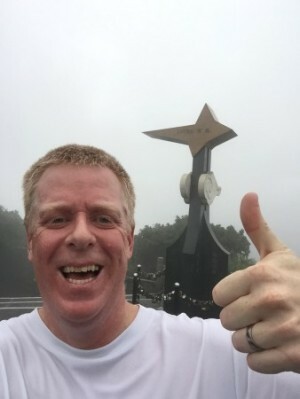 I took a opportunity to train in Chongqing, China. I arrived one day early, and went straight into my BP routine. I had no jet lag whatsoever. For 8 days this was my routine. I would wake up at 5am, sometimes I ran between 2 and 3 miles (as much for sightseeing as exercise), or lifted (to get the juices flowing), and some days I just stretched in my room. Then I would make my BPC. As soon as I drank the coffee I would feel full and satisfied. I would do a couple hours of answering emails, writing, and Skyping my family. Then at 8:30am I would head down to teach. I would teach from 9am till 10:30. The temperature in Chongqing, China was anywhere between 95 and 102 degrees Fahrenheit almost every day with 50%-60% humidity. The large meeting room we were in, even with the air conditioning cranked was often about 80 degrees and I would be quite hot the entire time, and as I normally do I drank a lot of water. When I taught in Almaty, Khazakhstan last year in similar temperatures I thought I was going to die. Then the class would take a “Coffee break”. I would walk over to the snack and coffee table. They had wonderful little cakes, sweets, and pastries, all bite sized and tempting to the eye, and a nice espresso machine. It all the looked very good, but I didn’t feel like having it at all. I would pass it up, and drink a bottle of water. The strange thing is that I simply didn’t want it. No hunger, no craving, it simply looked nice, but my I felt completely neutral about it. I had plenty of energy to give my presentation my full energy. What really surprised me was how clear my head was. I found myself remembering almost every word that was said during the training. This was wonderful because I could recall questions that students had asked 3 days prior and link it to the current material to reinforce the lessons. I could remember what was said is jest 4 days ago, and make a joking reference to it today. I found myself very focused on the moment, and this is important because I normally have a bad case of Shiny Thing Syndrome even when teaching. It reminded of the time when I was around eight years old and I got glasses for the first time. The first moment I slipped on my first pair of glasses I was shocked! I could see so far, I could see details that I could never see before. I was nearsighted, so seeing things much further was such a surprise, you don’t know what you don’t know, and when you never had glasses before you don’t know what you can see till you see it. At lunchtime I would eat with the group. The meals were traditional southwest Chinese served family style. So I ate lots of veggies, a little meat, and stayed away from the carbs. I will admit that the food available to me fit BP almost perfectly. The only suspect foods were some of the sauces and broths. How I felt was the real difference. I was only slightly hungry. I ate a reasonable amount because I wanted to try the dishes and enjoy the local cuisine. I can tell you to watch out for the Tofu in the dark red oily sauce, it is what I now refer to as Death Hot! I couldn’t taste anything else for 24 hours. I think there were only 2 days where I had a second cup of BPC, and on both occasions it was because I decided not to eat lunch because I was feeling so good, and wanted to enjoy the AC in my room. As I returned to teaching after a two hour lunch break, which was new to me, I felt great and still full of energy. It was very apparent to me, like I had on a brand new set of glasses that my mind was clear and focused. My ability to articulate words, which is very important when working with an interpreter, to answer questions concisely, remember a vast majority of the content that the students brought forth, and overall to deliver the content was better than I could remember. I am now home, and although my level of clarity isn’t quite the same as while I was in China, I am feeling great, and working to more fully integrate the Bulletproof Diet into my life, and feed my children based on what I am learning. If you want more information about the how to improve your performance, check out Dave Asprey on his Bulletproof Executive Website. I weighed 233 pounds on April 30th, 2015! 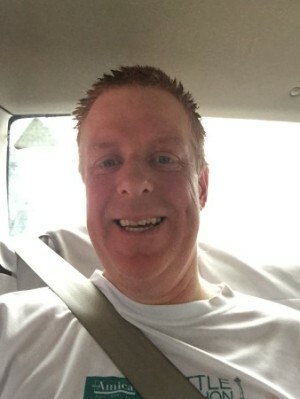 This entry was posted in Athletics, General on August 3, 2015 by Tony Husted. Velocity Is Coming To Seattle! We are very excited to announce that Velocity Language Learning is coming to Seattle! Well, Kirkland to be exact, on June 7th and 8th! “Is there is a fast and easy way to learn a new language? In 1985, Powell Janulus was entered into the Guinness Book of World Records for fluency in 42 languages. He could often show beginner fluency and comfortably converse in a new language in just a few months. How was this possible? Did he have a unique gift, or was his ability something anyone can do? Marilyn Atkinson, Ph.D., spent 7 years researching Powell’s unique abilities and developed a system that would allow anyone to accelerate their language learning. Paul Gossen refined this into the Velocity model for instant communication in any language. If you have ever desired to speak a new language or get more comfortable with one you have studied, you should consider joining us for a breakthrough in spoken fluency! The Velocity methodology can be used for any language, and for the June training we will be focusing on Spanish and English. The English will be for non-native English speakers. If you would like to work on another language, we can add an additional language if you can help us get 5 other participants that also want to learn that language! Please contact us for details. We have arranged a very special price for this our maiden roll-out in Seattle! Dates: June 7th, 8th, 2014. 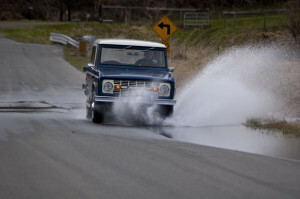 Location: Champagne Point Area, Kirkland, Washington, Zip Code 98034. Special Roll Out Investment: $400USD. This entry was posted in Velocity on May 5, 2014 by Tony Husted. I have studied and worked with Erickson College International for the last 11 years. For most of those years I remember Marilyn Atkinson from time to time mentioning her work with Accelerated Language Learning. I always wanted to know more, and as of a couple months ago, I finally got to experience it! This is the first post in a series of posts I will be putting together into a 60 Day Challenge. On April 17th and 18th I will be attending the 2 Day Velocity Program in Vancouver, BC on Spanish. That will be the start of the 60 days. The question is simple, how much of a Spanish Speaker can I become in 60 days? Below is a short introduction to my experience of Velocity Language Learning and why I am choosing to undertake this experiment. I will be adding additional information to this post to complete some of the thoughts. Have you ever wished you could learn a second or third language really quickly? Have you ever seen commercials for Rosetta Stone, but take a step back when you saw the $500 price tag? Most of us have. You, like me, have probably wished you could quickly and easily learn another language. I studied Spanish in High School, and didn’t learn much, then lived in Germany for two years and studied German in college. I know a little but never felt comfortable with it. That changed just a few months ago. I attended a single day, yes, one day of a training from Velocity Language. Velocity was founded my Mentor Dr. Marilyn Atkinson, based on her 35 years of modeling people who not only speak multiple (more than 30 in some cases) but could learn new languages in a few hours! Marilyn is a pioneer in the field of Expert Behavior Modeling. Based on the extensively modeled “best practices” of polyglots (someone who speaks more than 5 languages) she and Paul Gossen developed a two day intensive course for Transformation Spoken Fluency. Personally, I had some major doubts! I could not imagine any way possible to gain spoken fluency in 2 days. Oh how I was wrong! I attended just one day of the course on Mandarin, and was completely blown away! Beyond the fact that Mandarin is supposed to be one of the hardest languages to learn, I had no interest in learning Mandarin! I went to see what all the buzz was about. Do I speak fluent Mandarin now? Well, no, because I didn’t continue with any effort whatsoever, BUT, I did just have an unbelievable experience in Brazil with Portuguese. I was talking with the CEO of a large company in Brazil about how they speak to the company headquarters in Germany solely in English. He said many of the upper level Managers struggle with their fluency. So, I started telling him about Velocity. As you might be doing right now, he wanted to know how in the world you could do it in 2 days. So, being the adventurer that I am, I grabbed pen and paper, and my translator, and “mapped” out Portuguese. I spent the next 3 days working with all the tools I learned in my one day of Velocity, and had an amazing time speaking with my students, and the staff at the hotel. The real test came on the way to the airport. 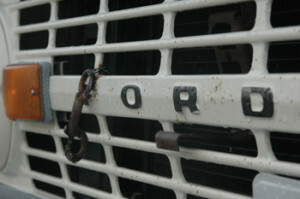 Because of Sao Paulo traffic, it was a 90 minute drive, and the driver speaks bare bones English. We spent the 90 minute drive speaking mostly in Portuguese! I would say at least 75% of the conversation was in Portuguese. HE LOVED IT! I found out about his family, his wife, his children, his hopes, his dreams, his hobbies, and his life. He in turn found out all about me as well. It was an amazing experience. As I sat at the airport waiting for my flight to depart, I got introspective for a few moments on it. Why was it such a powerful experience. Well, for one, it was what I love about Coaching, I got to speak to someone at a deep level. Second, it was a ton of fun! Then the realization hit me: What had changed about me! I realized that I had a very different internal dialog and feeling about learning Portuguese. I felt like: “If I were in Brazil for a month, I would be conversationally fluent.” And, it isn’t just Portuguese! I feel the same way about any language now. Give me a month in a foreign country and I could learn to speak the language! Charles W. Stavely was born Feb.1, 1901 and passed away Feb. 12th of 1992 at the age of 91. He was born in Indian Territory, Econtuska, Oklahoma and attended school in Seminole, Oklahoma, and later graduated from A&M College in Stillwater, Oklahoma. He belonged to ROTC for four years and received the rank of 2nd Lieutenant. He married after finishing collage and ROTC. They adopted a daughter later in life, and his wife Gretchen died at age 54. With the help of 2 foster families he raised his daughter (My Mom, Rose) until she graduated from High School and married. 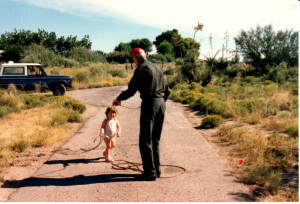 He then spent the next 44 years and 5 months with the Forest Service in Colorado and Nebraska. In May of 1944 he transferred from Colorado to the Nebraska National Forest near Valentine, Ne. 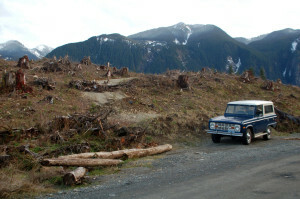 (Now Samuel R Mc Kelvie National Forest.) He was a ranger there for 16 years, then transferring to Denver Regional Office until 1963 when he retired. 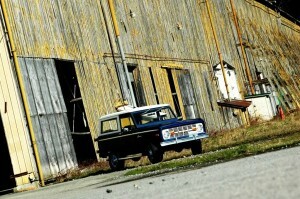 From 1963 to 1987 he traveled throughout the southern states in a Ford Bronco that he purchased new in 1974. (See Below) He spent most of his time along a creek bed, a rocky wall, or wherever there might find some gemstones, rocks or gold as he was an expert on all of these. 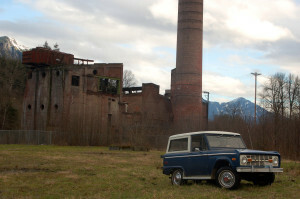 He traveled in the Bronco, well equipped with a water sack full of water hanging off the grill on the front of the Bronco, and his Geiger counter, gold pans, picks, hammers, magnifying glass, binoculars and all the other necessary tools needed for being a prospector, miner, nature lover and camper. It was believed that his only real fear of being out in the wild alone was being struck by a rattlesnake. He told many stories of his encounters and fears of them. He was a loner and loved to be out on a creek bed panning for gold or whatever he could find. 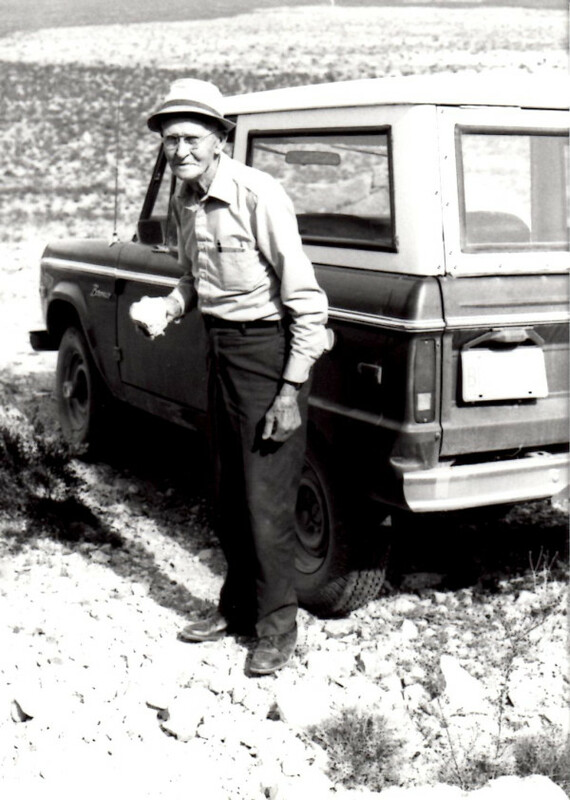 Charles was a jack-of-all-trades, handyman, carpenter, mathematician, avid reader of thousands of books, loved rocks, oh yes, the Bronco was always full of little samples of rocks, sand etc, that he carefully labeled as to what type it was, location found and date. He always had a notebook in his shirt pocket and took notes about everything. He kept a daily diary most of his life. 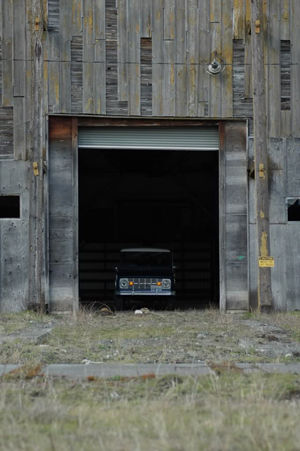 Every year for many years he and his Bronco traveled to two 20-acre land claims he had in Idaho along the Snake River where he had to do at least $100 worth of work or improvements on each 20-acres each year to keep them in his name. 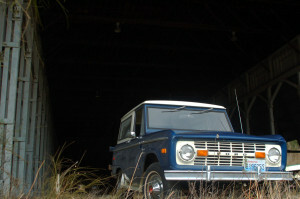 The Bronco made the trip each year, and he would spend 1-2 weeks out in the wilderness doing his work and enjoying the outdoors. No one really knew where these claims were and or where he was during those couple weeks. That was when he was in Paradise. 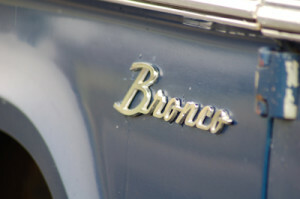 His Bronco served him well, and they worked those claims,(named the Cindy and Brenda claims, after his two granddaughters) for as many years as his health would allow him to work them. 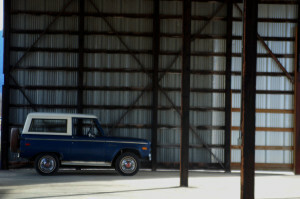 He drove his Bronco up until the last year or so of his life, when he gave it to his daughter who resides in South Dakota. 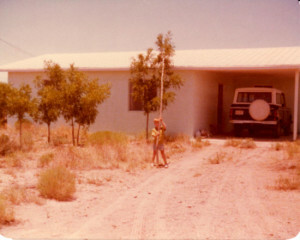 My Mom, Rose, and I traveled to Deming, New Mexico where Grandpa Stavely had been living in an assisted living home and Rose drove the Bronco back to South Dakota. She had it from 1991 until she gave it to me who lives in Seattle, Washington, in 2010. 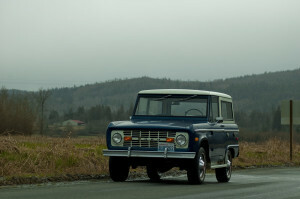 I had it shipped to Seattle, Washington from South Dakota in 2011, and I proudly drive it as often as possible! 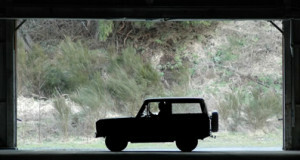 A few months ago I loaned the Bronco to some film makers who were creating a short film for an international multimedia conference. This is the result. Be sure to go HD and Full Screen! This entry was posted in General on February 4, 2014 by Tony Husted. Are you a Coach who wants more clients? If so, please take a moment and check this out! 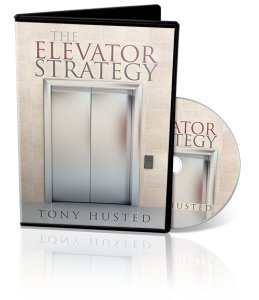 To go directly to the Create Space Store and Purchase The Elevator Strategy DVD CLICK HERE! Once you receive your DVD Contact me HERE to get your Free PDF with Alternative Variations, Examples, and the Full Script! I am very excited to finally be able to offer this material to you! At some point early in my Coaching career I faced a challenge that you have probably been faced with as well, a situation where you needed to explain, “What is Coaching?” or “What does a Coach do?” and you, like me, probably struggled to get your message across in a timely manner. As an International Coach and NLP Trainer for Erickson College International I have encountered hundreds of Coaches who have struggled with this very challenge. The answer many people will tell you is, and Elevator Speech. The concept of an Elevator Speech has been around for many years and is quite simple. An Elevator Speech is a pre-prepared speech meant to be used in 30 seconds to 2 minutes to explain what service or product you offer. Imagine being at a conference, another attendee gets on the elevator with you and asks what it is that you do. At which point you would then have the time it takes to travel a few floors to explain to this person, what you do, or how you could be of service to them. To make a long story short, I found, as many other successful Coaches have that most Elevator Speeches have a fairly low conversion rate to setting an appointment for a Free, or Complimentary Session. Your ideal client is standing in front of you, and you find yourself stumbling over the words and making it clear for the other person. I was like you, I struggled to convert people I just met into a Free Session. I knew there had to a be a solution and I set out to solve this challenge. One idea that kept coming back to me over and over throughout the entire search was very simple: Coaches ask questions. Dr. Marilyn Atkinson says it this way, “Questions are the Answer!” Coaches also create experiences with the client. These experiences are imagined in the mind/body system, and are the foundation for the client getting what they want in the world. So I took these two most basic pieces, asking questions, and creating experiences, and went forth to create a method of attracting people into Coaching. In this DVD I share the method that I created, refined, and implemented into my business with a 70% success rate! Within the next two weeks my new DVD, the Elevator Strategy will be available for sale on Amazon.com as well! This entry was posted in General and tagged Coaching Clients, Elevator Speech, Life Coach on April 25, 2013 by Tony Husted. I was recently blessed with the opportunity to travel to New York City. It was a busy trip with work taking up 9 of my 12 days there. I did manage to get in some pretty tourist stuff. When I went to Vienna and had a short visit I discovered Running Tours, they are like a Walking Tour, or Segway Tour, but instead of strolling, your guide shows up at your hotel room with running shoes on, and the adventure it on. 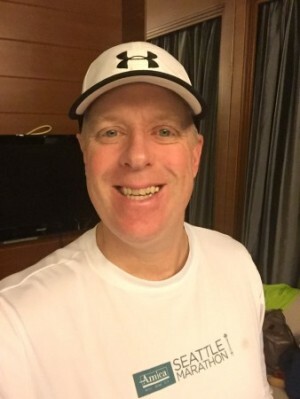 I contact New York City Running Tours to set up a 6 mile run for sightseeing, and training for the Seattle Half Marathon. Although I felt safe the entire time I was in NYC, it isn’t really the best place to take off on a run, and hope you don’t get lost. I had already run up 7th Avenue through Time Square to Central Park: a straight shot out and back from my hotel. Tackling Wall Street, the WTC Memorial area, and the Brooklyn Bridge was something else entirely. I set up my tour to start at 6am on my day off. My guide, Catie showed up right on time. We jumped on the Subway, which I hadn’t ridden yet, and we were off. During the subway ride Catie started to fill me on the background history of NYC, and I was amazed at how well she knew the dates, and people. She is an architect by education, so her knowledge of how the city was built, and the history of individual buildings was amazing. We got off the Subway near Battery Park, and within minutes we were running along the waterfront with views of New Jersey, and off in the still dark morning (we departed the hotel at 6am) the Statue of Liberty looking out over the New York Harbor. We cut into the city and headed towards Wall Street, and ran past the Bull that used as a placing shot in so many movies. Over my entire trip I was constantly reminded how many movies are set in New York, and how even thought it was my first trip, I had seen so many of the sites repeatedly, I felt like I have been there before. A quick stop on Wall Street, a 5 minute history lesson, and we were off again. Catie did a great job of keeping a pace that was comfortable for me. All the along the way she had tidbits of information, and facts about the city, the people, and the character of the city. As buildings came into view through the long canyons created by the buildings, she would point out the ones of interest, and fill me in on who built it, and how tall it was. 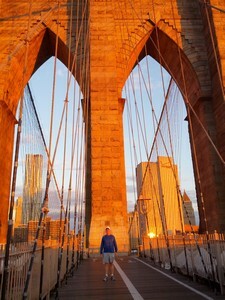 Next thing I knew, we were headed on the Brooklyn Bridge, which has an amazing history, and is so recognizable thanks to its hundreds of appearance on TV and the movies. As we got onto the bridge and looked back the sun was rising over the city, and there was a beautiful mix of clouds and clear skies that made it unforgettable. We stopped for a few quick snapshots, and we were off again. I wanted to run backwards so I could keep staring at the skyline and the sunrise. We dropped down into Dumbo and snaked out way over to the Williamsburg Bridge where we headed back towards Manhattan. Within a few minutes we were headed up Canal street. I was really struck by the change in architecture from neighborhood to neighborhood. Catie did a great job of explaining the actual geology of the area and how it directly impacts the architecture of the neighborhoods. Although we covered six and a half miles, I felt like we only ran two or three. It seemed so quick and I found myself regretting not having signed up for a ten miler. 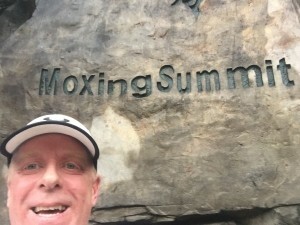 Although, I doubt my knee would have allowed me to go much further, it has been a little finicky since my eight mile run on the Birk-Gilman Trail. Within a couple of hours, the picture Catie took were in my inbox. I had such a great time, I called Michael and requested that we set up another run before I headed home. I had a specific place I wanted to go, and he was more than happy to accommodate my request. On Friday, Catie was back at my hotel with a custom route for us. The weather was sprinkling rain, and I appreciated that she gave me to option to call the shots, as I hadn’t brought gear for running in the rain. This time we headed straight north up 8th Avenue towards Central Park. The rain picked up a bit as we headed north, which was making me nervous. I didn’t want to get soaked, and cold, as I haven’t been the 100% healthy recently. After a short stop at the Columbus Circle, and an overview of the history of the park, we were off into the park. Within a couple of minutes of getting into the park, it started to pour down rain. Catie took action and we headed into the center of the park. The rain let up as soon as we turned. We ran into some of the less lit, and less traveled paths and places In the park, and again Catie’s knowledge of the history of the area was astounding. We continued through the center of the park, hitting the Mall, the Loeb Boat house, and the Weather Station. Soon we were running up the east side of the park on 5th Avenue after a quick stop to look at the outside of The Met. Before I knew it, we had covered another another mile or so, and suddenly we transitioned from Central Park to Harlem. I had asked to visit the Memorial Plaque for the Savoy Ballroom on Lenox Avenue, in Harlem. The Savoy Ballroom was the birthplace of the Lindy Hop in the 1920’s. I have been dancing Lindy and many other Swing dances that originate with the Lindy Hop since 1998, and although the ballroom hasn’t been there since 1958, and it is now apartments, a visit to the plaque had been on my bucket list for many years. 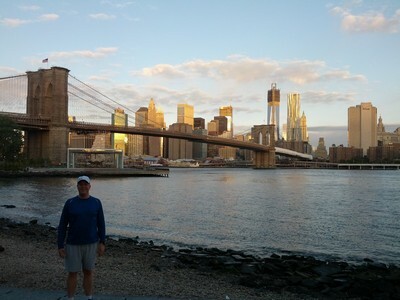 I highly recommend New York City Running Tours. It is a fabulous way to see the city, with top notch guides, and wonderful personalized customer service! I am looking forward to my next trip to New York, and my next running tour! The Savoy Ballroom Plaque marks the spot where Lindy Hop was born! 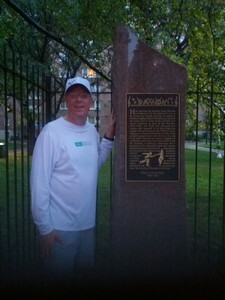 This entry was posted in Athletics and tagged Athletics, City Running Tours, New York City, Running, Savoy Ballroom Plaque, Tony Husted, Tours on December 29, 2012 by Tony Husted.